Provoking questions ranging from physicians oaths to Les McQueen. The Picture Round is on American State Capitals and the Wild Card is a chart statistic about that fantastic band REM. Q03. The oath taken by physicians is named after which famous ancient Greek? Q15. Our Velocity was a top ten hit for which band in 2007? Q28. What happened for the first time at the Wimbledon Tennis Finals in 2007? Q37. Hilary Briss, Matthew Chinnery and Les McQueen are all characters from which dark comedy first shown on BBC2? 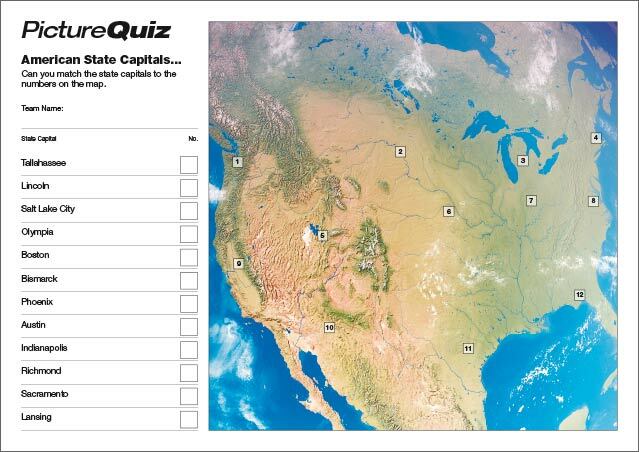 Here’s a low-res sample of the American State Capitals Picture Round, click for a higher resolution version. The Picture Round download is a two page high quality PDF with the answers on page 2. 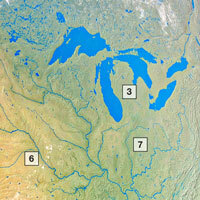 Quiz 025’s Picture Round is match the American State Capitals with the numbers on the map. The Wild Card for Quiz 025 is a chart statistic about that fantastic band REM.